"ITR: Computation Simulation, Modeling, and Visualization for Understanding Unsteady Bioflows," PI, NSF ITR Award CNS-0427374, $650K, October 2004– October 2009. "ITR: Visualization of Multi-valued Scientific Data: Applying Ideas from Art and Perceptual Psychology," PI, NSF Award CCR-0086065, $2,296,599, September 2000– August 2004. Innovations in Tensor Volume Visualization Anyone? Daniel Keefe, Daniel Acevedo, Jadrian Miles, Fritz Drury, Sharon Swartz, and David H. Laidlaw. Scientific Sketching for Collaborative VR Visualization Design. IEEE Transactions on Visualization and Computer Graphics, 14(4):835-847, July-August 2008. (pdf) (bibtex: Keefe-2008-SSF). David Karelitz, Daniel Keefe, and David H. Laidlaw. Using CavePainting to Create Scientific Visualizations. In Proceedings IEEE Visualization, Posters Compendium, page 109, October 2003. (pdf) (bibtex: Karelitz-2003-UCC). Michael Kirby. 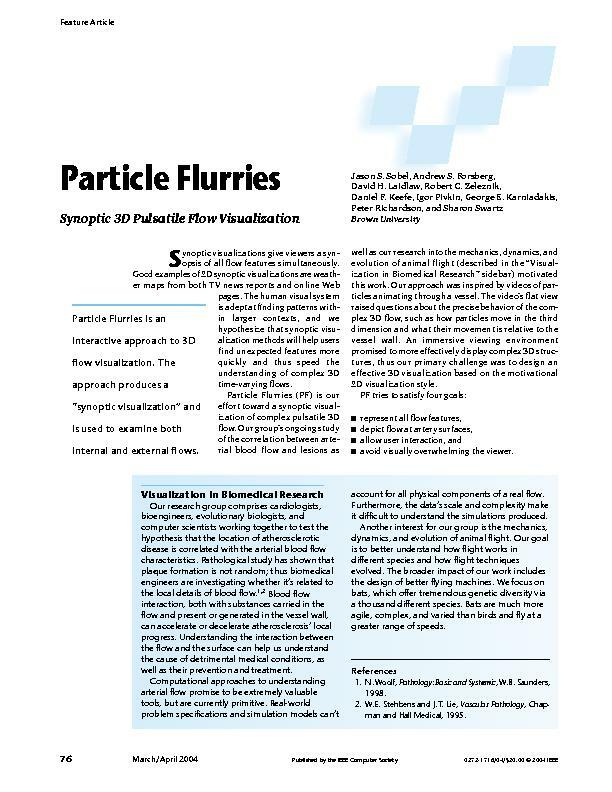 Dynamic Spectral/hp Refinement: Algorithms and Applications to Flow-Structure Interactions. PhD thesis, Brown University, Division of Applied Mathematics, 2002. (bibtex: Kirby-2002-DSR). Michael Kirby, T. C. Warburton, S. J. Sherwin, A. Beskok, and George Karniadakis. The NEKTAR Code: Dynamic Simulations without Remeshing. In Proceedings of the 2nd International Conference on Computational Technologies for Fluid/Thermal/Chemical Systems with Industrial Applications, 1999. (bibtex: Kirby-1999-TNC). I. Lomtev, Michael Kirby, and George Karniadakis. A Discontinuous Galerkin ALE method for viscous compressible flows in moving domains. Journal of Computational Physics, 155:128-159, 1999. (bibtex: Lomtev-1999-DGA). Timothy Urness, Victoria Interrante, Ivan Marusic, Ellen Longmire, and Bharathram Ganapathisubramani. Effectively Visualizing Multi-Valued Flow Data using Color and Texture. In Proceedings of IEEE Visualization, October 2003. (pdf) (bibtex: Urness-2003-EVM).